Election Day is here, and Dickinson is getting out the vote in a big way. 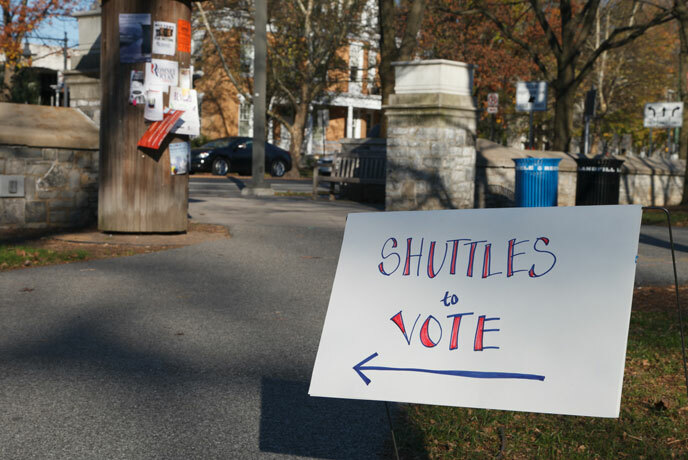 Students can take free shuttles to and from the polls, courtesy of "celebrity" drivers, including President Margee Ensign. The shuttles will travel between the ATS parking lot and the polling station at the nearby Grace Baptist Church, from 8 a.m. to 8 p.m. If bicycling is more your style, you can take advantage of a student-organized bike-to-the-polls campaign, from 11 a.m. to 2 p.m. Weather permitting, bicycles will be available for students to borrow for group rides to the local polling station, scheduled to run every half-hour. And while you wait for your shuttle or bike, you can enjoy complimentary fair-trade coffee and tea, courtesy of the student-run Peddler coffee cart. To learn about the current local political climate, Assistant Professor of Political Science Sarah Niebler and several of her students will conduct exit polls at several Cumberland County polling stations, including Grace Baptist Church. Election Day will conclude with a nonpartisan election watch party in the HUB Social Hall, beginning at 7:30 p.m. Attendees will enjoy free food as they watch election-night coverage on the local public television station, WITF. These events arrive on the heels of a series of on-campus informational lectures, club events and panel discussions, organized by student clubs, The Clarke Forum for Contemporary Issues and the Dickinson Votes Committee to help prepare Dickinsonians to make informed voting choices. Yesterday, the president’s office additionally sent out a reminder email to students with helpful information about polling places, ballots and candidates. And on Nov. 2, President Ensign sent an email message to campus employees, announcing that Dickinson will allow full-time employees up to two hours of paid time off so they can get to the polls. “As a college dedicated to civic learning and action, and founded to educate leaders for the new democracy, we encourage all community members to participate in our democratic process,” Ensign wrote. Looking ahead, Dickinson will host a public voting-machine demonstration and informational session, presented in partnership with Pennsylvania state officials, on Dec. 12. Dickinson will be one of only six higher-ed institutions in Pennsylvania to host this demonstration.